One of the most poignant reminders of World War I is the moving poem, ‘In Flanders Fields’, written by John McCrae, a Canadian army doctor, following the death of his close friend and compatriot Lieutenant Alexis Helmer. Helmer was killed on 2 May 1915 when a shell exploded during the second German gas attack. In the absence of a chaplain, McCrae conducted the funeral service for his friend himself. Grief and the trauma of war inspired his poem. At the time, Major John McCrae was working in a field dressing station on the road between Ypres and Boezinge. While there, he was mainly involved in treating victims of the German gas attacks. Soon after he wrote the poem, he was transferred, as Chief of Medical Services, to a Canadian field hospital in France, where the wounded from the battles of the Somme, Vimy Ridge, Arras, and Passchendaele were treated. McCrae discarded the sheet of paper on which he had written the poem. It might never have been published but for a fellow officer who found McCrae’s notes and sent them to a number of London magazines. The poem first appeared in the magazine Punch and immediately touched the hearts of the British people. 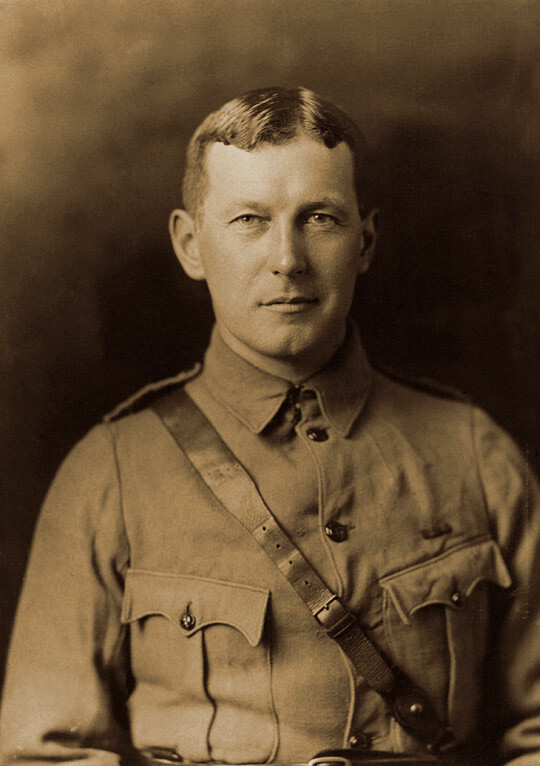 In the summer of 1917, John McCrae suffered attacks of asthma and bronchitis, almost certainly as a consequence of inhaling chlorine gas during the Second Battle of Ypres. On 23 January 1918, McCrae fell ill with pneumonia and was admitted to hospital. He died five days later at only 46 years of age. 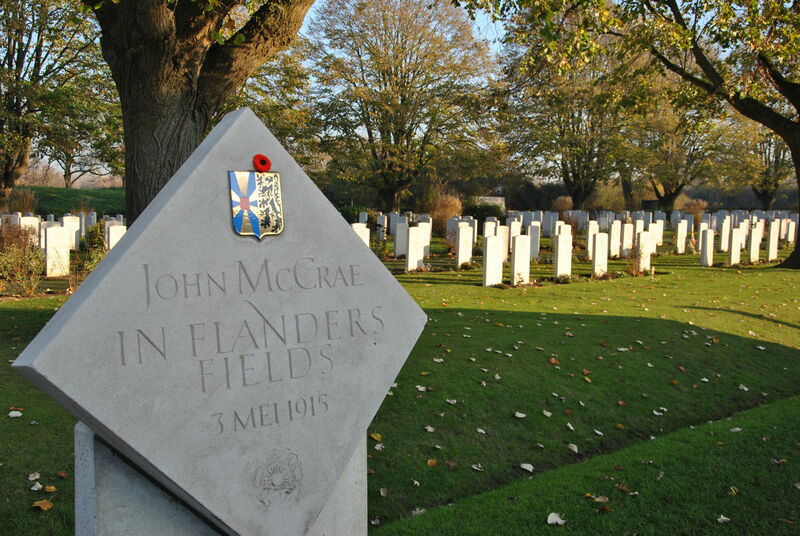 McCrae is buried in Wimereux, north of Boulogne (France). One of the best known sites in the Ypres Salient is Essex Farm Cemetery and the nearby A.D.S. (Advanced Dressing Station), where John McCrae wrote his world-famous poem ’In Flanders Fields’ at the beginning of May 1915. In addition to the cemetery and the adjacent concrete shelters of the old dressing station, the bank of the canal has also recently been opened to the public over a distance of 450 metres. It was here that the guns of the 1st Canadian Artillery Brigade stood in April 1915 and it was on this spot shortly afterwards that the Royal Engineers built a number of shelters and dugouts for the protection of the troops in the high canal bank. This bank had originally been dug in the 17th century by the French military architect Vauban as a ’retranchement’, a large fortifi cation alongside the canal, which for more than 50 years constituted the northern border of Louis XIV’s French empire. Shortly after the 1918 Armistice, the numerous bunkers in the bank also served as temporary accommodation for many of the refugees returning home. High on the canal bank stands a monument to the 49th West Riding Division, which was first deployed here in the summer of 1915 and suffered heavy losses. No symbol so strongly recalls the Great War as the poppy. It is to the fore in every ceremony and parade on Remembrance Day. Every year, tens of millions of paper poppies are assembled. Their bright red colours catch the eye, on both people and monuments, on 11 November. The origins of the ‘remembrance poppy’ are to be found in a poem by John McCrae, a Canadian army doctor. On the otherwise barren front, where thousands of soldiers had recently perished, he saw vast numbers of poppies blossoming. A military graveyard full of poppies is an image that captures the imagination and strongly evokes the ambiguity so characteristic of the Great War. 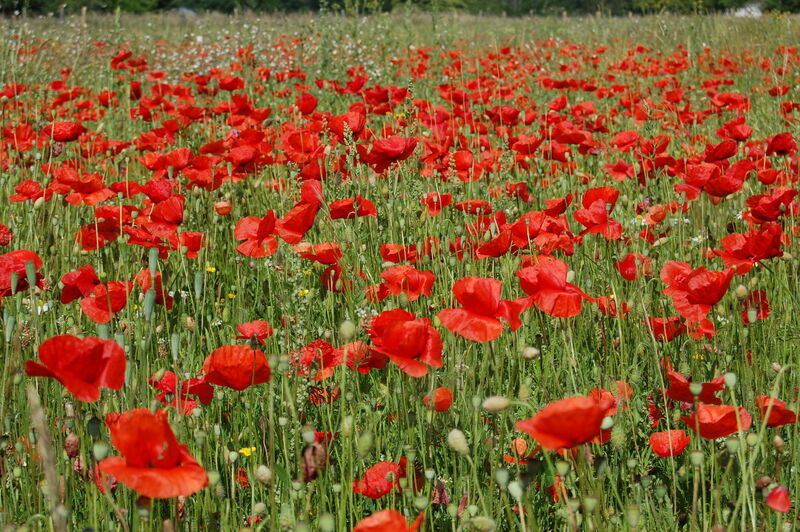 For the poppy has many aspects to it: irrepressible yet ephemeral, wilting but also uplifting. It is a vulnerable flower, on the borderline between ode and elegy. For McCrae, the poppy kept alive the memory of a young generation that was nipped in the bud before it could bloom. His words touch a chord with a great many readers. John McCrae would not live to see his poem’s success. In 1918, the year in which McCrae died, a young American woman became the first person to pin a silk poppy to her clothes. Her symbolic gesture was copied throughout the British Commonwealth and the poppy was soon adopted as the official symbol to be used in commemoration of the victims of the Great War.